In part 1, I discussed how one opportunity open to translators is to convert narrative to dialogue. Below, I would like to discuss three books I recently read which do this – with varying degrees of success. The Voice identifies the speakers within the stories. This format helps readers understand quickly who the characters are and what the relationships are between them. These identifications also provide natural divisions for group readings of Scripture. I am sorry to say this, but only someone who is completely tone-deaf to Hebrew and English could possibly believe that the English should be scripted out in this way. The corruption is so total that it gives the reader a completely misleading idea of the Hebrew. In converting to dialogue form, the translators have distorted the original to the point of corruption. One of the peculiarities of The Voice is that while it is supposed to be an easy-reading version, it adopts the approach of many settings of the King James translations of using italics to identify “additions” to the text. This is odd because italics normally represent stressed text in contemporary layouts of English – and this feature is one of the most commonly criticized layout decisions of King James editions. I wish to make a note about the physical quality of this Bible. My copy, at least, was of poor physical quality. Like many other Bibles bound by Thomas Nelson, this edition has bad binding. Worse, my copy had pre-creased pages. 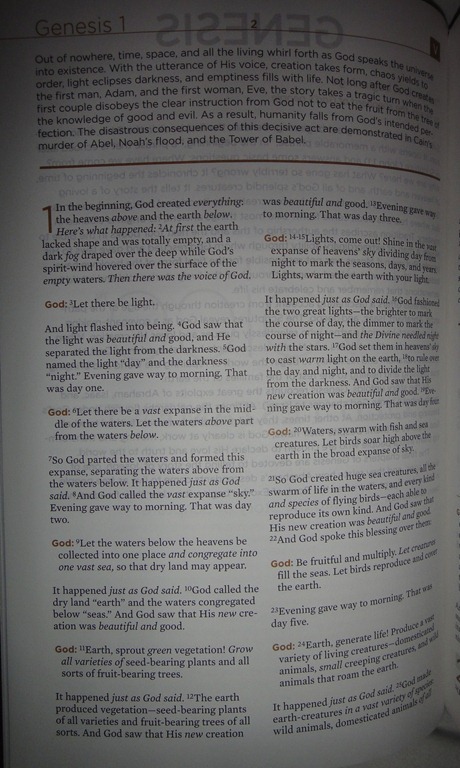 The book claims to be “guaranteed for life,” but as I previously mentioned (see the last paragraph of this post) about another Nelson Bible, this appears to be merely a crude attempt to get people to sign up for mailing list; and there is contradictory information on the so-called guarantee. Every translation, even the most self-consciously and flat-footedly slavish, is somewhat interpretive. But I have tried to make this one as uninterpretive and close to the original as possible. One conscious deviation from strict accuracy, however, will be obvious at a glance. The Republic is largely in reported speech. 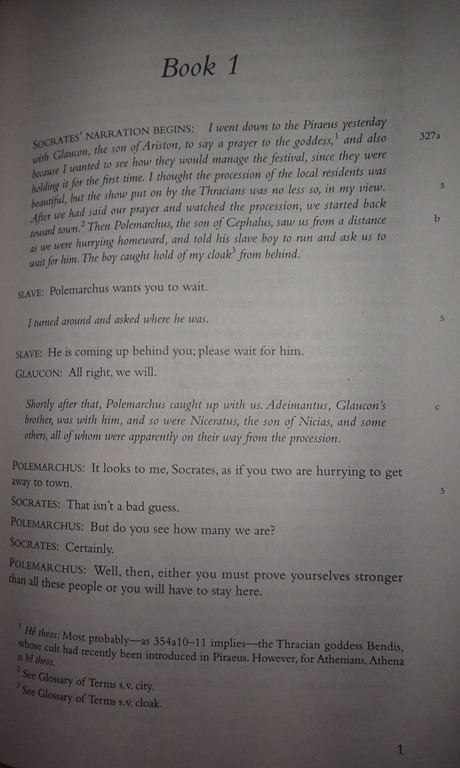 Socrates is relating a conversation he had in the past. But I have cast his report as an explicit dialogue in direct speech, with identified speakers. In the Theaetetus, Plato has Eucleides adopt a similar strategem. “This is the book,” he says to Terpsion; “You see, I have written it out like this: I have not made Socrates relate the conversation as he related it to me, but I represent him as speaking directly to the persons with whom he said he had this conversation.” Decades of teaching the Republic have persuaded me that the minimal loss in literalness involved in adopting Eucleides’ stratagem is more than made up for in readability and intelligibility. I have to say, this is a brilliant presentation. Why does Reeve succeed while The Voice translator’s fail? I think it is perhaps because The Republic is not a text of action, but one of ideas. It is almost totally a description of dialogue, and so converting it to dialogue form does minimal damage to the text. And, as Reeve correctly states, it does make it easier for students (and everyone else) to read. The final example I wish to give is the Cleveland-based Ofeq Institute’s The Complete Mesillas Yesharim (Path of the Upright). Ramchal’s book is considered to be the primary modern text of mussar (Jewish ethical teachings) literature. The Ofeq Institute’s version must be considered authoritative, because the editors use a recently discovered manuscript from the Moscow State Library in Ramchal’s own hand. This is believed to be an earlier draft of Mesillas Yesharim. 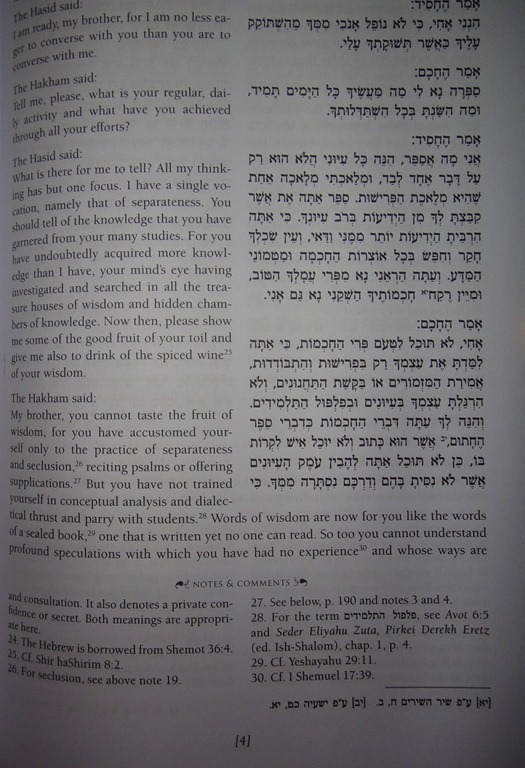 However this version is put in the form of a dialogue between a hakham (wise man) and a hasid (pietist). This convention really makes the book sparkle. 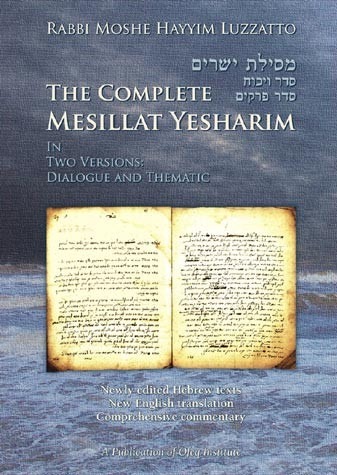 Perhaps because of its wide use in yeshivos, Mesillas Yesharim has a reputation of being a tedious book in some circles. But the earlier draft is somewhat livelier, and certainly makes the book easier to read. Now, this may seem like a ringer – since the author himself put the text in dialogue form. But nonetheless, the Institute’s courageous decision to print the unpublished draft together with the final version makes for a much more enjoyable reading experience. As with the Republic, Ramchal’s text is not a text of action, but rather a text of ideas, and thus particularly well suited to being cast in dialogue form. I like how, in Part 1 of your series, you show the problem when you yourself “clearly changed the author’s meaning and the nuance of the text.” But you insisted that you didn’t want to change Jane Austen’s meaning or, for us her readers, the nuances of her Mansfield Park. This seems to be the entire issue. But let me nuance this a bit. Plato’s Socrates and Xenophon’s Socrates used dialectic, the much-studied and much-used device of rhetorical questioning. Plato’s written dialogs in Greek suggests that translators into other languages might, indeed, reformat material to preserve the dialogue format in rather non-Greek textual conventions. Rhetoric scholar George A. Kennedy (in New Testament Interpretation Through Rhetorical Criticism) looks at dialectic in Paul and in Jesus and likens it to dialectic in Socrates. For example, Kennedy says the “[s]peeches attributed to Paul” as portrayed “by the literary abilities of the writer or writers of Acts” may be read as somewhat “analogous to the portrayal of Socrates in Plato and Xenophon” (pages 139-40). In other words, the Greek form of the dialogue in Acts is not so different from the Greek form of the dialogue in the dialectic written by Plato and Xenophon. This leaves room for English translators to do with Paul in Acts what they might do with Socrates in The Republic. Likewise, Kennedy says that the Greek dialectic of “chapters 13 and 14” of the “evangelist” (i.e., the writer of the gospel of John) “is somewhat reminiscent of the dialogues in which Plato present Socrates as [typically] engaged in a preliminary discussion of a subject which is then reopened in a deeper and more extensive way” (page 85). 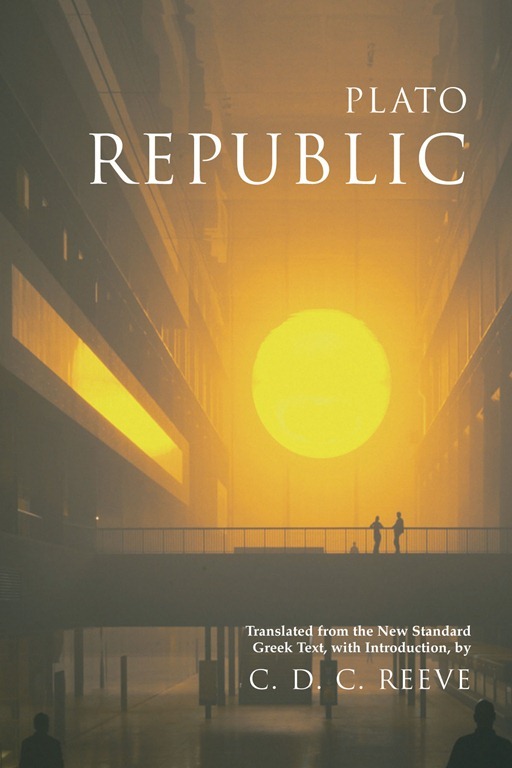 So, if the Voice translator(s) of the Gospel of John might use an English format like Reeve’s for The Republic, then would you like them both equally? Kurk, I have not read Kennedy’s book so I cannot really comment. But you can read the Fourth Gospel in The Voice translation here and make up your own mind. I was not going to comment about the NT translation of The Voice. But one of the things I like least about the NT translation of The Voice is that they assign character dialogue to characters in some of Jesus’s parables in Synoptic gospels. Thus, the parable becomes “a play inside a play.” If you have a copy of The Voice, you can see this at Matthew 20 with its characters “Landowner” and “Workers.” But this seems, again, tone-deaf to the fact that in the New Testament text, this is an extended parable about the kingdom of heaven, which is completely spoken by Jesus. 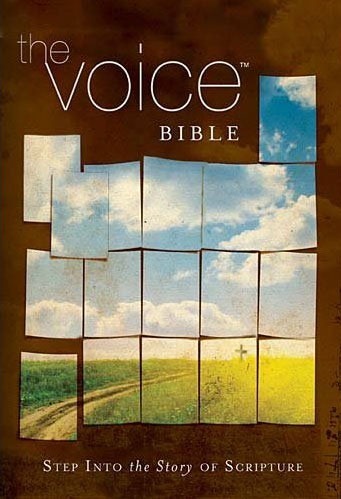 When The Voice was first being hyped a couple of years back, I asked my local Christian bookstore to get me a copy. The best they could come up with was a cheap paperback edition of Romans. It was more than enough. The text was highly interpretive and its arrangement on the page was annoying. When I found a note at Romans 7:24, explaining Paul’s cry “Who will rescue me from this body of death?” by reference to an alleged Roman practice of punishing murderers by binding the corpse of the victim to the body of the killer, I did enough research to learn that this was no Roman custom at all. It was, rather, a single incident from the Aeneid, involving King Mezentius, and very likely fictional. It was enough to put me off the of The Voice entirely. That’s an incredible story and I must say I agree with you on every point. 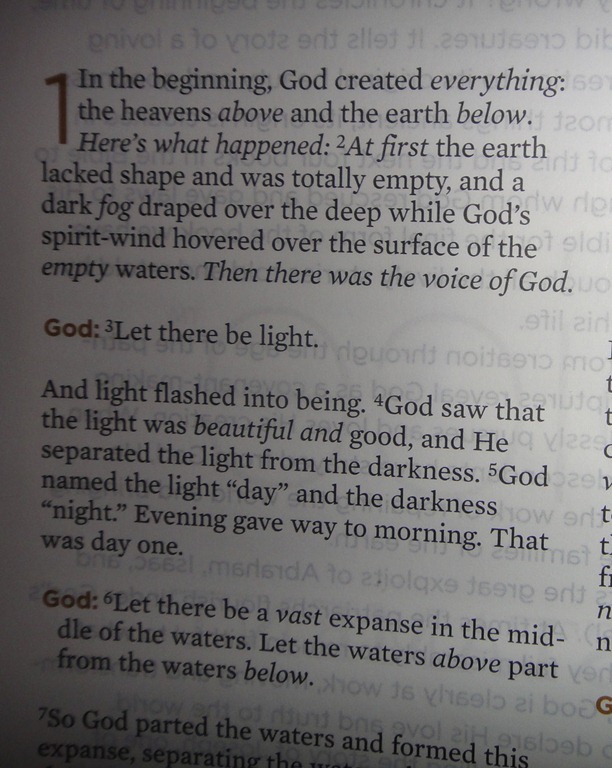 However, it may be of interest to you to know that in the version of The Voice that I bought (a “translation” of the complete Protestant Bible) that note no longer appears. This, however, does not change your basic criticism. Perhaps the biggest chutzpah in the hardcover edition is that it has a blurb on the back endorsing it by Darrell Bock (identified as “Ph.D., Dallas Theological Seminary”) — and two inches above it, it asserts that Darrell Bock was one of the translators. It is quite damning for to need to search so far and wide for a blurb that it must be obtained from one of the creators of the book. Thanks, Theophrastus, for the link to the fourth gospel as rendered by The Voice. 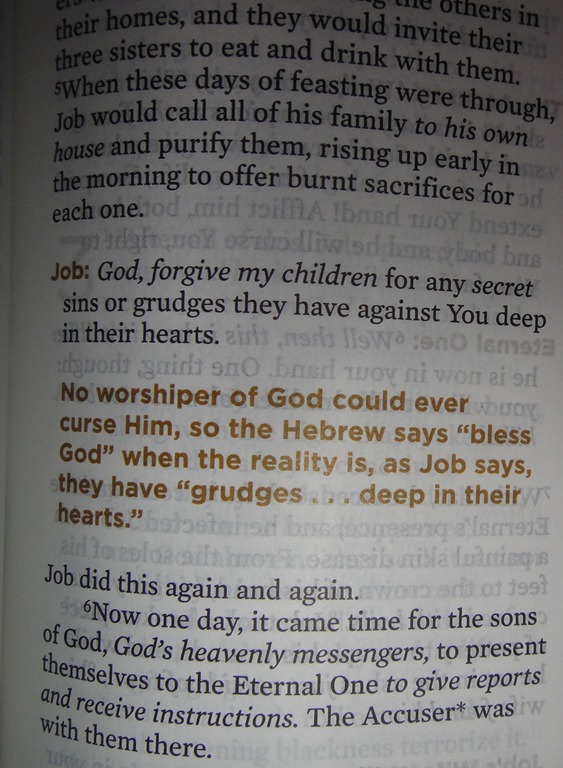 I was immediately curious to see what the translator(s) chose to do with John 3:10-21. It’s a bit of a puzzling dialogue for Greek readers because the narrator of the original text does not mark where the speech of Jesus ends. Nonetheless, The Voice translator has determined that the whole bit must be attributed to Jesus and that the narrator does not pick up again until 3:22. Brant, I googled to see if the Romans passage in The Voice was also posted online somewhere. Here’s the only thing I found, very related: http://thepaperthinhymn.com/2011/11/13/the-myth-of-carrying-a-dead-man-on-your-back-the-body-of-death/. Thank you, both, for the information. And thank you for including my blog in your blogroll. I feel honored to be found in such company!